One of the most important pop songs of all time, this award-winning classic brought together some of the biggest names in the recording industry at that time for famine relief. 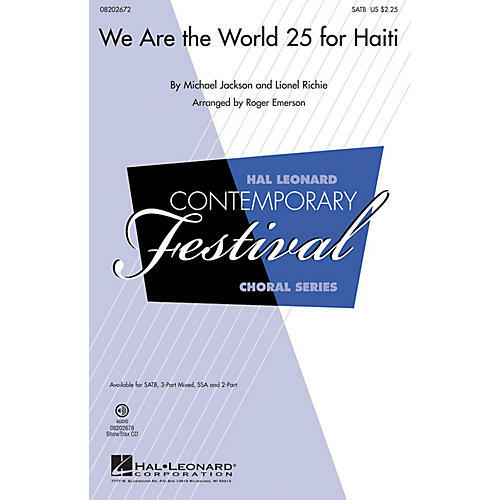 Now, for the 25th Anniversary of the song, the recording industry's biggest new stars have come together to raise funds for Haiti. This will be a powerful and inspirational message for our time! This carefully crafted arrangement allows choirs to perform this with or without the new rap section - the ShowTrax CD includes accompaniment tracks for both options. Available separately: SATB, 3-Part Mixed, SSA, 2-Part, ShowTrax CD. Duration: ca. 5:00.